Label reads "Ka-Lae String Instrument Manufactures of Honolulu, Hawaii. Patent date Jan. 3,1928". According to the Kamaka Website, From 1940 to 1946, Johnny Lai was given permission by Sam Kamaka Sr. to use the Kamaka factory on evenings and weekends when business was closed. Lai used the name "Ka-Lai" on the ukuleles he made, a combination of "Kamaka" and "Lai." The name was later changed to "Ka-Lae" because it sounded more Hawaiian. 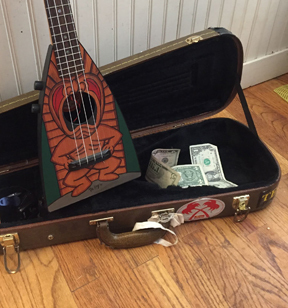 Lai's ukuleles were made of monkeypod wood, a less expensive alternative to Kamaka koa ukuleles.